There are several species of St John's-wort in Britain and Ireland, but this is one of the less commonly seen of the group. It is a low, creeping plant and much smaller than most other Hypericum species. The flowers are typically 8 to 10mm across. 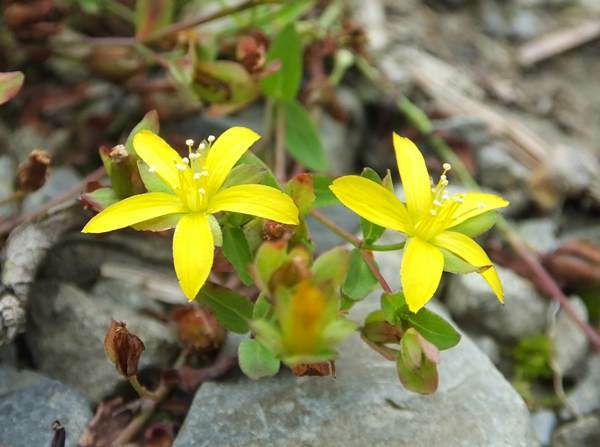 Trailing St. John's-wort is widespread but most common in the west of Britain and Ireland. Trailing St John's-wort can easily be mistaken for yellow pimpernel; a distinguishing feature is the longer leaves of the St John's Wort and the narrower petals. We found this specimen growing on dry soil in a sunny spot in the Teifi Valley in West Wales. The photograph was taken in early August.